Karen Gillan is a Scottish actress and former model, best known for playing the role of Amy Pond in the hit British sci-fi TV series Doctor Who. Gillan's early roles came in television, including the sketch comedy The Kevin Bishop Show and The Well, a series of episodic short horror films for the BBC. Her first stage appearance was in the John Osborne play Inadmissible Evidence, which debuted at London's venerable Donmar Warehouse in October 2011. She will also be featured in the independent comedic film Not Another Happy Ending, directed by John McKay. 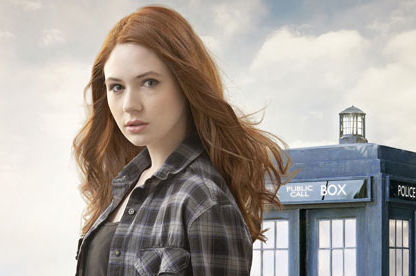 In May 2009, Gillan was cast in the coveted role of Amy Pond, the Doctor's companion, in the long-running hit British science-fiction television series Doctor Who. The role was a major breakthrough for the actress, taking her recognition factor to the next level. She and actor Matt Smith, who played the time-traveling doctor, quickly became British television's hottest couple. The two (who, they claim, were never romantically linked) achieved superstardom and were mobbed by fans in several locations around the world. She played Nebula in the blockbuster Guardians of the Galaxy, its sequel, and Avengers: Infinity War. Karen will be appearing Sunday and Monday only.